MONTEBELLO >> Losses have become so rare for the Cantwell-Sacred Heart of Mary High School baseball team in recent seasons that most associated with the program can’t remember the last time it suffered three-consecutive setbacks.The Cardinals are still wondering after making sure Wednesday they wouldn’t experience an unwanted three-peat.Jared Thomas hit a leadoff home run and Mark Saavedra threw 5 2/3 scoreless innings to help CSHM end a two-game losing skein with a 5-0 victory over visiting Mary Star of the Sea in a Camino Real League game.Ruben Rios had two RBIs and Johnny Rodriguez and Zach Thomas had two hits each for the Cardinals (9-3, 3-0), who had lost consecutive nonleague games to Warren and Bonita. Jared Thomas, who was hitting .400 entering the game, gave CSHM the early lead when he hit Hunter Bjazevich’s first pitch over the right-field fence for a 1-0 advantage. The Cardinals made it 2-0 in the inning following singles by Zach Thomas and Rios. Zach Thomas led off the third with a double and scored on a squeeze bunt by Rios for 3-0 lead. Saavedra took care of the rest. The sophomore limited Mary Star (7-3, 1-2) to three hits and struck out five in his five-plus innings. He ran into some trouble in the fourth, but pitched his way out of it. Carlos Vega led off with a single and Mo Magno was hit by a pitch. Both then stole third and second, respectively. But Saavedra induced Joe James to fly out to short right field before he sandwiched a walk to Nathan Trudnich with strikeouts of Kazenoshin Hayashi and Kevin Costa. CSHM scored a run in the fifth and sixth innings for a 5-0 advantage. Daniel Ordonez got the final four outs, including two strikeouts, to seal the win. 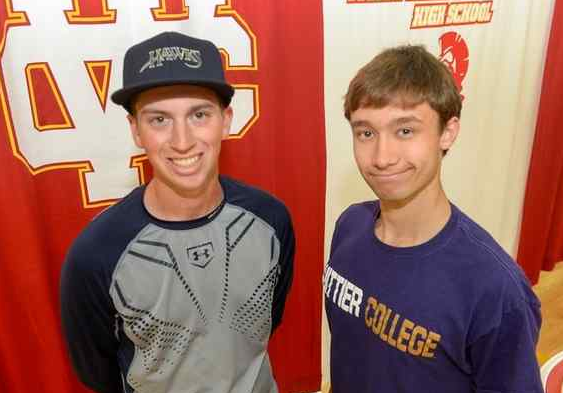 Whittier Christian High School athletes Carl Hudson and Ben White made their college decisions Tuesday, each signing letter of intents in a ceremony at the La Habra school. Hudson will play baseball at NAIA San Diego Christian and White will run cross country for Whittier College. Hudson plays three positions for the Heralds, helping them to a 9-7 record this season. He has seen time at catcher, first base and in the outfield. San Diego Christian (12-14, 7-11) competes in the Golden State Athletic Conference. White was one of the top runners in the area last season, placing 30th in Division 5 at the CIF State championships in Fresno. He had a time of 16 minutes, 41.2 seconds. He was 13th at 15:50 at the CIF Southern Section finals. Whittier College competes in the Southern California Intercollegiate Athletic Conference. Alyssa Martin Del Campo and Cierra Amarillas-Salazar, key members of the Cantwell-Sacred Heart of Mary softball team made their college choices Wednesday, each signing with Benedictine University of Mesa, Arizona in a ceremony at the Montebello school. CSHM is 5-6 this season. Pioneer will host its alumni baseball game at 11 on Saturday. Former Titan players are asked to call coach Bobby Ramirez at (951) 751-0080. La Mirada, which was 9-2 heading into a Suburban League game at Artesia on Wednesday, is the lone area team in this week’s CIF-SS baseball rankings. The Matadores, who will compete in next month’s Boras Classic in Orange County, are No. 3 in Division 2. La Habra, after losing to Valencia, dropped to No. 7 in the Division 1 softball rankings. Other area teams ranked are La Mirada and California, who are Nos. 7 and 8, respectively, in Division 3, and Schurr, which is No. 3 in Division 6. Whittier Christian is No. 8 in Division 4 in boys volleyball. Whittier Christian 2, Maranatha 1 — Freshman Jaden Hernandez had a game-winning RBI for the Heralds (8-6), who won their Olympic League opener. Ally Udell was the winning pitcher, striking out seven and had a double and an RBI. The Minutemen (9-1) lost their first game of the season. Valley Christian 3, Whittier Christian 0 — Cade McGee had 12 kills and 14 digs and Justin Osborn had eight kills and 11 blocks for the Heralds (10-6, 2-1) in a 25-14, 25-20, 27-25 Olympic League loss. 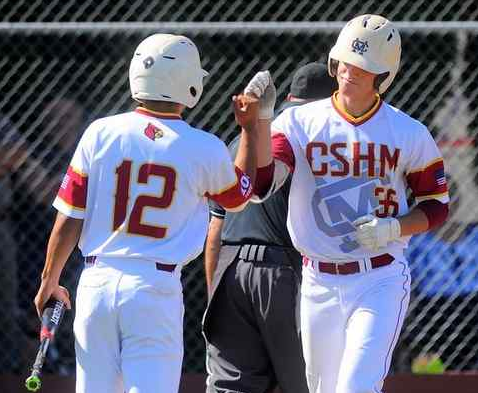 WHITTIER >> Baseball took a back seat for Whittier and Santa Fe high schools Friday. The two area teams paid homage to fallen Whittier Police officer Keith Boyer, who died in the line of duty on Feb. 20, prior to their Del Rio League opener at Whittier High. 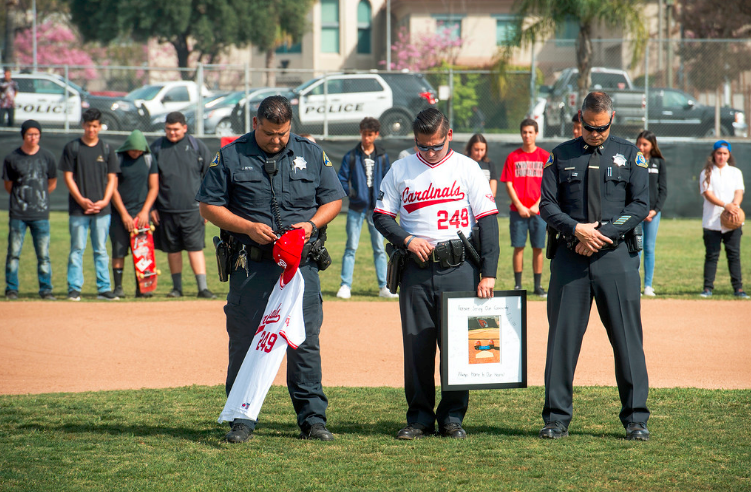 Whittier held a pregame ceremony, which included a moment of silence for Boyer, a presentation of a Cardinals team jersey to the Whittier Police Department and Whittier Police officer Damien Velasco throwing out the first pitch. Santa Fe rallied for a 5-2 victory in the game. But that mattered little to first-year Whittier coach Larry Patino. “Today was a tough baseball game,” Patino said. “(Santa Fe) was the better team today. But I go home with my hair standing up because I’m really excited. We didn’t just play the game of baseball. In the game, Santa Fe scored four runs in the fifth to rally for the victory. Chiefs pitcher Isaiah Gonzales had two hits and tossed a five-hitter with five strikeouts to help the Chiefs put a 1-7 start to the season behind them. Whittier (4-7) got RBIs from Alex Andueza and Ian Fregoso. Benji Avila pitched four shutout innings before being replaced due to a pitch-count limit. Santa Fe, after falling behind 2-0, got consecutive singles from Jorge Centeno, Sergio Medrano and Matthew Garcia to cut it to 2-1 in the fifth. Ruben Romero then followed with a two-run single for a 3-2 lead. Romero scored on an error to push it to 4-2. Raul Ramirez had a RBI fly in the sixth for a 5-2 advantage. Gonzales, after giving up two doubles and a single in the third to fall behind 2-0, gave up just two hits and a walk over the final four innings to get the win. “I left a couple pitches on the plate and they capitalized,” Gonzales said. “When I got in the dugout, Romo said I needed to start working down. We just stuck to the game plan against them. SANTA FE SPRINGS >> St. Paul High School didn’t win the Del Rey League softball title last season, The Swordsmen are hoping to change that in 2017.Thursday they took a step in that direction.Tatum Anzaldo hit a two-run home run and had three RBIs and St. Paul took the first advantage over rival Bishop Amat with a 6-1 victory in the league opener at Jersey Fields. 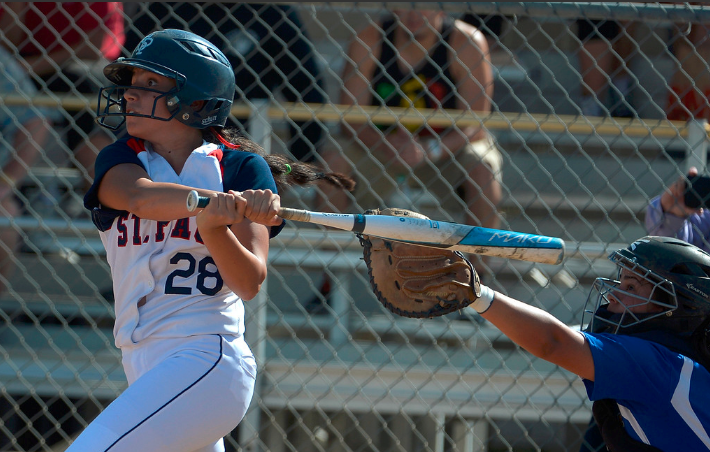 Nia Carter had three hits and scored three runs and Sydnee Krattenmaker had a two-run triple for the Swordsmen (3-1). Alexis Bermudez gave up seven hits and struck out three for her third victory. Bryanna Perez had three hits for the Lancers (2-7-1). Anzaldo, after Bishop Amat cut it to 2-1 in fifth, had the big hit and turned the edge back to St. Paul. She drilled a line-drive to center field, which easily scored Carter for a 3-1 lead and she beat the throw home for the inside-the-park homer and a 4-1 advantage. Krattenmaker all but sealed with a two-run triple to left-center field in the sixth for a 6-1 advantage. Bermudez got in a little trouble in the sixth, but induced Alyssa Avalos to line into an inning-ending double play with runners on first and second. Bermudez retired the Lancers in order in the seventh, ending the game by catching a line drive by Gabby Bracamonte.